This article is about the character from Mario Party Advance. For the species of Shy Guys, see Shy Guy. 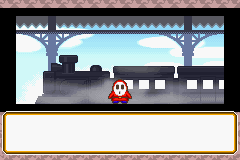 Shy Guy is a character in Mario Party Advance that works at the Train Station. He is very polite, often speaking in a courteous manner, and according to his description, will work diligently without complaining and without resting. When the player arrives at the Train Station, Shy Guy notices them and asks for their help. If they accept, Shy Guy tells them that he had ran out of coal for the trains, and he asks for their help in looking for coal. However, he doesn't actually know where coal can be retrieved, only that it isn't sold in the item shop. Once some coal is brought back to him, he will happily accept it and give the Cake Maker Gaddget in return. Afterwards, he says that he will not forget the player's kindness. French Maskass Pun on "masque" (mask) and "casse" (break). This page was last edited on September 30, 2018, at 18:08.